Having trouble finding archives that have the materials you need? 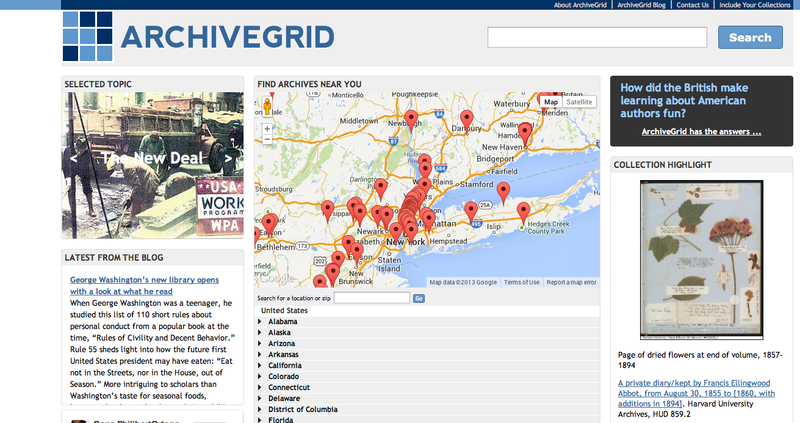 ArchiveGrid is a great tool to use if you do not know where to begin your search! It is a free resource that allows the user access to information about different collections and finding aids that any of the participating archives have. ArchiveGrid became a free website in 2012, allowing researchers to use its database without subscribing to it, like it had done in the past. The database contains over two million searchable archival collections. 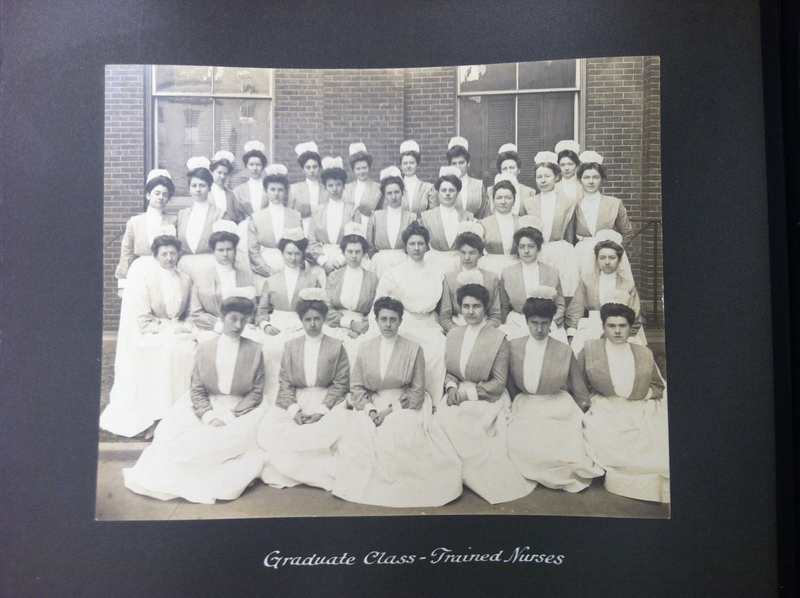 According to the about page on the ArchiveGrid website, it“provides access to detailed archival collection descriptions, making information available about historical documents, personal papers, family histories, and other archival materials. It also provides contact information for the institution where the collections are kept.”The website is designed to recognize your current location so that it can best serve your search needs. When you receive your search results, they are ranked by both closest in proximity and the hits that best fits the phrase you searched. ArchiveGrid is supported by the Online Computer Library Center (also known as OCLC). OCLC is an organization that connects different libraries from all over the world. OCLC also manages the infamous WorldCat, the database that Bobst Library uses to make their catalogues searchable. Like OCLC, ArchiveGrid gives archives and libraries the opportunity to share their collections with the World Wide Web, allowing them to reach out to more people than they could in the past. For my digital archive and website, I am focusing on St. Vincent’s Medical Center, once located on Greenwich Village on W. 11th Street until its close in 2010. Since this institution is no longer open, I have been searching high and low for all sorts of documents that would be relevant for my research. ArchiveGrid was one of the major tools that I have used and has directed me to different archives that I can utilize. 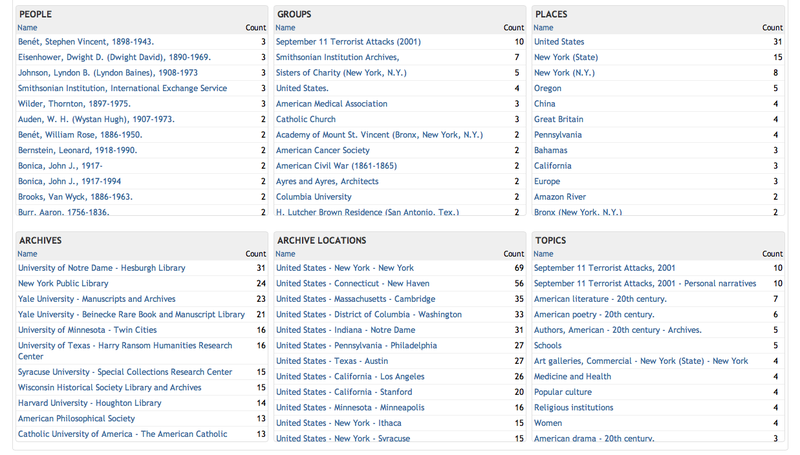 The ArchiveGrid search bar is at the top right where you can enter any phrase or topic that you would like to search. When I typed in “St. Vincent’s Hospital NYC,” I received 631 results. The website divided its findings into a result list and a result summary. When you click on the “Result Overview” tab, it breaks down the results based on: people, groups, places, archives, archive locations and topics. This is very useful when trying to narrow down the 631 matches that ArchiveGrid provided for me. You can conduct your search from here by choosing a specific topic. The results generated on the “Results Overview” helped me identify different topics about St. Vincent’s that I would like to focus on in my online exhibit. For example I can select the group “Catholic Church,” or the topic “Medicine and Health,” since St. Vincent’s was a Catholic medical center. I can also select narrow my search by the location of the archives. When I click on New York, I am left with 69 results, much smaller from my first search. The different collections range from oral histories from 9/11 victims who were treated at St. Vincent’s, to the papers of doctors or an AIDS activist videotape collection. Under each collection is a description, if available and the name of the archive that the collection is located. The researcher can than click below that the link for either contact information for the archive or the finding aid for that collection. For example, the 9/11 oral histories are located at Columbia University and I am then directed to their contact us page on their website. From here I can browse through their collection and determine if I need to make a visit to their library. I now know that I have the ability to include information on St. Vincent’s significant role after the events of 9/11 into my exhibit as well as any information regarding the AIDS clinic that was established at St. Vincent’s. ArchiveGrid is a great resource to use if you are looking for archives to go to without having to visit them right away and making any unnecessary trips. It also helps you to be a more efficient researcher as you can go into any archive that you find on ArchiveGrid and know exactly which collection and even which folder you are looking for. For more information on ArchiveGrid and OCLC check out their websites!